Golf Buggy for Sale – Travel the Course in Style and Luxury! When it comes to golf buggies, you only want the best. Whether you’re powering along on the fairway or you’re looking for your ball in the rough, you want something that goes beyond the traditional “boxy” cart – something sleek, modern and full of style. Something that no ordinary “golf buggy for sale” can deliver. That’s why we’re proud to present the future of golf buggies: the IM4 Golf Buggy and the FourStar Golf Cruiser. This buggy doesn’t compromise on features or luxury. With a powerful 1300 watt motor, it’s strong enough to clamber up steep course hills, yet strong enough to withstand the harsh (and unpredictable) Australian climate. Luxury leather seating keeps you cradled in comfort while low-impact turf tyres make for a cleaner, greener course. A win-win for you and the course maintenance guys. Most golf buggy for sale ads feature buggies that have admittedly had their day in the sun. Maybe they’ve got a rattle that’s hard to find, or missing a few parts. Not the IM4 single seater golf buggy. Its reliable 75Ah batteries let you cruise effortlessly over 50km before needing a recharge. And its hardy suspension gives you a smooth ride, even over uneven surfaces. 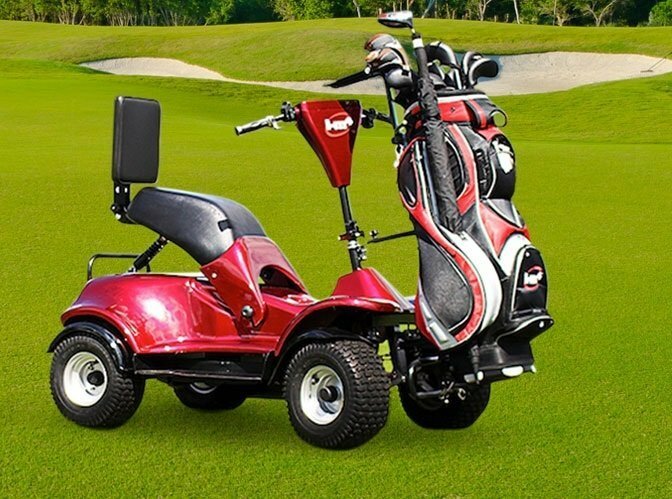 Combine that with its slim, compact design, and you’ll have more than just a “golf buggy for sale” – you’ll have a stylish vehicle to help you enjoy many more years of playing the game you love. The Fourstar Golf Cruiser is the future in golf buggy design. 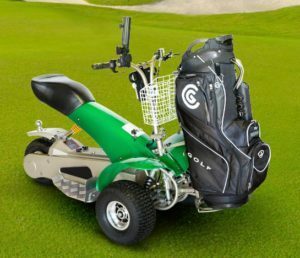 With its innovative collapsible frame, you can simply roll it into your car for a quick afternoon round at the club. And its dependable 1000 watt motor can carry you up and down hills with ease. Go ahead – follow your own ball and relax between shots. It’s the way golf was meant to be! And with its reliable 20Ah batteries, you’ll enjoy many, many rounds before it needs to recharge. The Fourstar Golf Cruiser helps you concentrate more on your game, not your partners game. Ready to go beyond your typical “golf buggy for sale” and get into an affordable, dependable and stylish ride that won’t break your budget? Whether you want the full featured IM4 or the innovative and compact Fourstar Golf Cruiser, buying a golf buggy for sale will have you traversing the course with ease and style – the way it was meant to be! Call us today to order yours and make your next trip to the fairways your best game yet!